Blaze monsters are hostile Mobs that spawn in Nether Fortresses. They have 10 hit points and are able to launch Fire Charges or even use melee attacks. The mob is bright yellow with rods and smoke that surrounding it as it hovers in the air. When killed a Blaze can drop Blaze Rods and 10 experience points for the player. The mob will try to keep distance between the player as it can through three fire charges at the player. 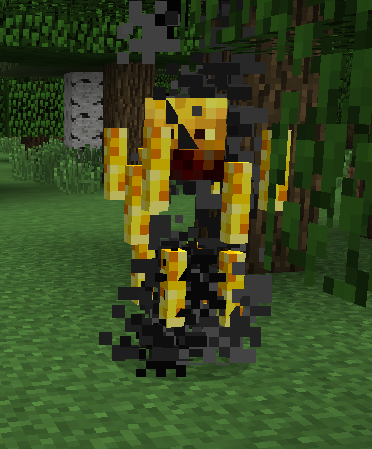 The fire charge will set anything it hits on fire and can not be knocked away like you can with the Ghast Mobs ability. Using Water or Snowball is a way to damage Blazes. It is wise to note that they are able to fly, so close range combat becomes almost useless when fighting them. Blazes can spawn from Monster Spawner and are a great source of experience points if you find one in a Nether Fortress. One strategy to beat Blazes is to use a Fire Resistance Potion making all their attacks negated so you can easily kill the Blaze. Another strategy is to use a Fishing Rod and drag the Blaze into your melee range so you are able to use a Sword.